Led by staff naturalists, our tours illuminate the diverse wildlife, native plants and rugged beauty of the historic Santa Margarita Ranch. Our tour includes an adventurous ride on our vintage Humvee as well as easy-paced hiking. 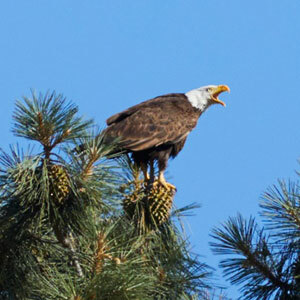 The tour includes observations of a bald eagle nest site and native California birds of prey, as well as a walk through a riparian habitat to our educational site. Here, you will learn about how natural systems and life cycles connect us all. Our tours easy! Our friendly guides will lead the way and make sure that you are comfortable throughout your tour. Please wear comfortable attire and closed-toe walking shoes. Be sun smart—wear a hat and bring sunscreen. Pack a water bottle; we can provide refills. Bringing a camera and binoculars will enhance your experience; we also have binoculars to share. All participants should be in good physical condition and able to participate in moderate short-duration hikes. If you have health concerns, or if you have conditions affecting the heart or legs, please consult a physician prior to joining the tour.